We’d love your help. Let us know what’s wrong with this preview of Reinventing Comics by Scott McCloud. In 1993, Scott McCloud tore down the wall between high and low culture with the acclaimed international hit Understanding Comics, a massive comic book that explored the inner workings of the worlds most misunderstood art form. Now, McCloud takes comics to te next leavle, charting twelve different revolutions in how comics are created, read, and preceived today, and how the In 1993, Scott McCloud tore down the wall between high and low culture with the acclaimed international hit Understanding Comics, a massive comic book that explored the inner workings of the worlds most misunderstood art form. Now, McCloud takes comics to te next leavle, charting twelve different revolutions in how comics are created, read, and preceived today, and how they're poised to conquer the new millennium. To ask other readers questions about Reinventing Comics, please sign up. Better as a cultural artefact than anything else (though I did occasionally enjoy certain historical tidbits). Perhaps this would have been more hard-hitting if I had read it when it was published in 2000, but half-assed discussions of diversity and cutting edge technology like CD-ROMs makes it woefully obsolete (and the writing wasn't anywhere near as engaging as its predecessor). Understanding Comics needs an update just because I'm interested in his take on the subject matter now; this is in Better as a cultural artefact than anything else (though I did occasionally enjoy certain historical tidbits). Perhaps this would have been more hard-hitting if I had read it when it was published in 2000, but half-assed discussions of diversity and cutting edge technology like CD-ROMs makes it woefully obsolete (and the writing wasn't anywhere near as engaging as its predecessor). Understanding Comics needs an update just because I'm interested in his take on the subject matter now; this is in dire need of an update for it to maintain any measurable relevance. Read through it in the library today. This is the first book I'm reading from Scott McCloud, however I hope to read more. In the first chapter, he outlines reasons why he's worried about the comics industry, but it's very clear he's writing from the 90's. It really had me thinking, every other sentence, I wonder what the state of affairs is now and whether he's still concerned. He described a kind of "bubble" of comics-creation that inflated and then burst in the 90's. I work in the games industry Read through it in the library today. In the first chapter, he outlines reasons why he's worried about the comics industry, but it's very clear he's writing from the 90's. It really had me thinking, every other sentence, I wonder what the state of affairs is now and whether he's still concerned. He described a kind of "bubble" of comics-creation that inflated and then burst in the 90's. I work in the games industry, and it was honestly rather interesting to hear the way he described the comics industry of the "bubble" time, in which it seemed the demand for comics was going up and up, but really it had reached its peak-- it a little bit makes me reflect on the games industry that I'm familiar with at this present moment. I was interested in this book just to see if Scott McCloud had any tips for the how-to's of developing and creating comics-- I didn't find as much as I was hoping for, maybe I'll find it in one of his other works. I read through the chapters about 'digital comics', it was really more a reflection of what McCloud expected, at the time of writing this, the effect of computers would be on comics. At times I was groaning over the out-dated-ness, at other times I was stunned by some kinda outlandish ideas (comics on a rotating virtual cube? Virtual-reality comics? very Holodeck...) and there are a few things he mentioned which seem to have come true, in a general way-- like digital comics. One thing that *was* very interesting and helpful and my favorite part, was his review of the history of comics publishing houses. That was very interesting to read from an insider. Understanding Comics is significantly better and definitely stands the test of time much better (the half of this that discussed Technology seemed small-thinking in 2017 since it was written in 2000; I suppose it's exciting that many of McCloud's predictions definitely came true -- but it also left me wanting much more because I wonder what predictions he has NOW for what comics will look like in 2040) but this was a fun and interesting read. A more pragmatic book than his Understanding Comics—and thus a bit less timeless, perhaps—this is nevertheless a clear, well argued and explained essay. Persuasive, thoughtful, and clear. Comics-as-essay still is a niche style, although I would like to see it used more, and McCloud is a master of the form. Other than his 3D Lincoln comic this is probably Scott McCloud's most overlooked comic, but unlike the Lincoln thing this book deserves your attention. Yeah, even today, still. Many people have claimed that this book was dated when it hit the shelves and is certainly irrelevant now, a historical curiosity at best. That's partly true. McCloud's cry for more diversity in subject and viewpoint in comics is as relevant as ever (the dated caricatures of 90's diversity notwithstanding,) and his histor Other than his 3D Lincoln comic this is probably Scott McCloud's most overlooked comic, but unlike the Lincoln thing this book deserves your attention. Yeah, even today, still. Many people have claimed that this book was dated when it hit the shelves and is certainly irrelevant now, a historical curiosity at best. That's partly true. McCloud's cry for more diversity in subject and viewpoint in comics is as relevant as ever (the dated caricatures of 90's diversity notwithstanding,) and his history of the business side of comics... well that's certainly a historical curiosity now, but history is important, ESPECIALLY in business, where people tend to take the same old pratfalls over and over. His micro-payments proposal is less than inspiring, and is the weakest part of the book by far, especially now with the benefit of hindsight. He identifies the problem (specifically: "Whoops, we've been giving away all of our comics for free, how do we earn money off this now?") But then he fails to provide a compelling solution. Now it's 15 years later and webcomics are in a worse hole than ever. The successful comics are still successful, but the only viable merch for an up an coming creator to sell is a printed version of their comic, effectively preventing webcomics from taking advantage of the power of the WEB at all, instead using it as a stopgap until enough of a readership forms to PRINT THE BOOK. That's not Scott McCloud's fault, but this book didn't help, either. So why am I giving the book a 5-star rating? Well, it's kind of a low five, considering all the chapters that fail to be manifestos and now feel more like filler. But there is a stunning jewel in the surrounding stone, and if you chipped away everything else the book would still be worth whatever you paid for it (these days probably like a quarter) for this chapter alone. Of course I'm talking about the Infinite Canvas and Digital Comics chapter. Even it is not free of dated details, particularly a section on the wonders of Kid Pix, BUT DON'T LET THAT DISTRACT YOU. Scott McCloud's vision for the future of comics is crystal clear here, at last. And it's one of the most inspiring bits of comics theory I ever read, maybe moreso than Understanding Comics. Infinite Canvas is a road not nearly as well traveled as it by rights aught to be, but that doesn't make it a flawed concept. Some people see Infinite Canvas as a gimmick, and indeed the chapter can read like a list of gimmicks, if that's what you're expecting to find. Let's do as Scott does, though, and separate form from content. What's the difference between a gimmick and legitimate storytelling technique? Well, a gimmick is a technique that exists for the sake of itself, that holds no content, except maybe the extremely obvious or superficial. All it takes for a gimmick to transform into a legitimate technique is for somebody to recognize a way for this gimmick to deliver content in a way that no other technique could. And Scott McCloud makes a compelling case that the right creators could blow this whole comics thing wide open, transform comics into its most primal form and then transcend it, using Infinite Canvas (which is a MUCH more broad concept than people think) as their tool. That more people haven't heeded Scott's call is saddening, but it's understandable. This book is not Understanding Comics. That book was revolutionary in how it attempted to free comics from their cultural baggage and dig into what really made them tick, at the core. As transgressive as the idea that comics have "infinite potential" was at the time, you didn't have to leave the safety of your favorite genre to appreciate it. Reinventing Comics on the other hand (at least, the good parts of it) was a roadmap for the future. Scott McCloud does not seem like a violent man, so he stopped short of asking us to tear down society, but in order to appreciate Infinite Canvas we had to, at least, tear ourselves away from our comfort zone. And wade through some muck to get there, besides. So it's understandable that only a select few have really taken his message to heart. Karl Marx was a great describer of capitalism, but turned out to be pretty terrible at forecasting its fall. It is a lot harder to predict or influence the future direction of something than it is to describe it. McCloud gives it a good college try, though from 2011 Reinventing Comics has aged a lot more than Understanding Comics. I am impressed that McCloud for the most part doesn't fall on his face, though as I read it I was constantly wondering how he is reacting to the state of comics NOW - Karl Marx was a great describer of capitalism, but turned out to be pretty terrible at forecasting its fall. It is a lot harder to predict or influence the future direction of something than it is to describe it. McCloud gives it a good college try, though from 2011 Reinventing Comics has aged a lot more than Understanding Comics. I am impressed that McCloud for the most part doesn't fall on his face, though as I read it I was constantly wondering how he is reacting to the state of comics NOW - which is the pitfall of a book that is positioned on the tip of the quick moving digital revolution. I'm sure there are parts of this book that were out of date by the time it took for the book to be published - hell, even as McCloud was inking this sucker you wonder how much he had to tear up and re-write. Like with Understanding Comics McCloud tries not to get too bogged down in the minutia, he focuses on the conceptual heart of comics - "sequential art". Most of the subject of this book is McCloud's hopes for his favourite art media - comics - it's filled with his bias for a wider field for comics to play. You can feel his frustration that the majority of the comic business has stuck to superheroes. I wish there was a wider field myself, and I can see McCloud's points that comics have so much potential. Yet McCloud finishes his book in rather airy, some-what hysterical rhetorical flourish. It is such a symbolic flourish I wonder if it is a way to paper over the fact that he has many wishes and hopes for the future, but is actually pessimistic that the same forces that have kept comics restricted to the men-in-tights genre are going to continue to predominate in Western comic culture. This sequel to Understanding Comics: The Invisible Art is more fragmented, kinda preachy, and less interesting. Part 1 of his manifesto for the reinvention of comics focuses on their public perception, industry missteps, and the need for more diversity (in all senses of the word). Solid stuff. Part 2 focuses on the digital revolution and its implications for comics' creation, distribution, and format. He ends with some lofty talk about comics breaking free of the printed page. His idea of the infi This sequel to Understanding Comics: The Invisible Art is more fragmented, kinda preachy, and less interesting. After Understanding Comics, this was disappointing. The economic analysis did make sense and I'm fully on board with the need for both authorial and genre diversity. However the long-winded exposition about comics' potential as an art form, especially in the digital realm, far exceeded my interest in the subject. Also, McCloud's prose style (long, declarative, overly dramatic sentences bisected by "but" or "and") grew very tiresome after 200 pages and the second half of the book needed a severe After Understanding Comics, this was disappointing. The economic analysis did make sense and I'm fully on board with the need for both authorial and genre diversity. However the long-winded exposition about comics' potential as an art form, especially in the digital realm, far exceeded my interest in the subject. Also, McCloud's prose style (long, declarative, overly dramatic sentences bisected by "but" or "and") grew very tiresome after 200 pages and the second half of the book needed a severe editorial pruning. Like McCloud's earlier Understanding Comics, this book is a must-read for anyone who plans to work in the graphic novel genre. Though it's now eight years from its publication date, its predictive power and perspective remain right on target(and the presentation style keeps it a fascinating read). Find a copy and enjoy it! Back in the mindset of if I'm losing reading time to research, I'm putting them here. It helps when they're about comic books, and fully illustrated as if it was a comic book. More textbooks should be like this. Well, I for one certainly was not thinking about the Internet in 2000, so all the stuff in here you'll be warned is dated was pretty fascinating to me. He's such a good man, and thorough. Scott McCloud the author, describes Reinventing Comics not as a sequel to Understanding Comics but as it’s own book. Reinventing Comics focuses more on the business side of comics and how comic artist were affected by the fall of comics in the 1990’s due to drop in sales, interest and limited collector items almost killed comics and caused a large majority of comic book stores to be shut down. 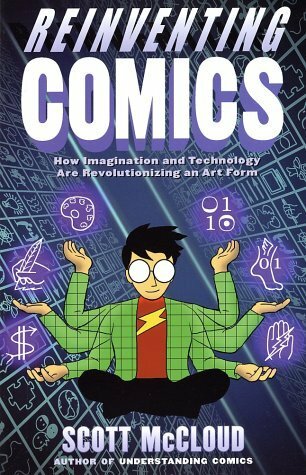 Many people believe that this book is solly McCloud's opinions rather than breaking down how comics wor Scott McCloud the author, describes Reinventing Comics not as a sequel to Understanding Comics but as it’s own book. Reinventing Comics focuses more on the business side of comics and how comic artist were affected by the fall of comics in the 1990’s due to drop in sales, interest and limited collector items almost killed comics and caused a large majority of comic book stores to be shut down. Many people believe that this book is solly McCloud's opinions rather than breaking down how comics work and how they rose and declined in popularity through the 1990’s. Though McCloud does mention in his book that these are mostly his ideas on how to fix how comics are sold, advertised and made. Here’s more about the book itself, Reinventing Comics, just like Understanding Comics is drawn like an old comic book, panel to panel. The art style can be seen as bland and boring since there is no action and all you see is the author’s character talking directly to the reader. Though, McCloud does use great examples from real life comics and artist to prove his point along with the funny/strange visuals from time to time. Overall, Reinventing Comics isn’t an awful book and it isn’t a long read, but it doesn’t live fully up to Understanding Comics. There are still things to learn from it, like how the internet changed how comics are read and viewed and at times it seems that McCloud is demonizing online retailers for selling comics instead of a physical copy. But I wouldn’t buy this book at its current price, $17.89, I feel it might be a little overpriced and outdated to be so much. I love Scott McCloud. I love the way he thinks about the art form of comics and I love the fact he has embraced the technological revolution whole-heartedly. That said, this is a fascinating book for a number of reasons. While I'm a huge fan and have owned Understanding Comics and Designing Comics, reading them several times each over the years, if I've read this one before, I don't remember it. And I think part of that reason is because the this other two are much more timeless, dealing with un I love Scott McCloud. I love the way he thinks about the art form of comics and I love the fact he has embraced the technological revolution whole-heartedly. That said, this is a fascinating book for a number of reasons. While I'm a huge fan and have owned Understanding Comics and Designing Comics, reading them several times each over the years, if I've read this one before, I don't remember it. And I think part of that reason is because the this other two are much more timeless, dealing with universalities in terms of form and function, storytelling and design. Reinventing, on the other hand, is looking at both the transitory nature of the industry and the technology used to produce the actual product said industry manufacturers. It is not, by any stretch, timeless. And that is what makes it so fascinating. Written in 2000, 17 years ago as of this writing, it's amazing to see what McCloud got right as well as what he got wrong about where the future would lead us. Some of his ideas on the ever-expanding canvas and the form online comics could and would take have come to pass and seen fruition. While others have not. There was no way he could have predicted the smart phone, but he did nail the idea of tablets and e-readers. Reinventing Comics is a fascinating look at the evolution of comics and digital media in the Internet age. McCloud was incredibly prescient, and despite its age this book still has important things to say about what comics and technology can do for storytellers. I only identified one topics that McCloud, and many others, were dead wrong about: the rise of novel forms of data visualization. I mean, don't get me wrong, data visualization is huge, but mostly using visual metaphors similar to those t Reinventing Comics is a fascinating look at the evolution of comics and digital media in the Internet age. McCloud was incredibly prescient, and despite its age this book still has important things to say about what comics and technology can do for storytellers. This is a prescient book that is relevant to all creative people, not just those who care about comics. McCloud covers issues ranging from creative ownership to the impact of technology on the distribution pipeline (and thus creative freedom). Many of these issues apply to technologists as well as to artists (consider how services like AWS have made it easier to create internet based businesses). Even though the book was written in 2000, McCloud's analysis of the internet with respect to publishi This is a prescient book that is relevant to all creative people, not just those who care about comics. McCloud covers issues ranging from creative ownership to the impact of technology on the distribution pipeline (and thus creative freedom). Many of these issues apply to technologists as well as to artists (consider how services like AWS have made it easier to create internet based businesses). Это была бы хорошая книга, прочитай я её в 2005. Автор рассуждает о перспективах искусства комиксов в мире, который движется в сторону цифровой среды. Любая футурология - большой риск (если вы не Станислав Лем). Угадать практически невозможно. И МакКлауд читается как такой романтик из прошлого, грезящий о небе, наполненном дирижаблями. А будущее наступило. Цифровая среда поменяла нас, но не так, как хотелось бы. Скотт никак не учёл влияния свободного копирования, пиратства и проникнования юридич Это была бы хорошая книга, прочитай я её в 2005. (Note: 5 stars = amazing, wonderful, 4 = very good book, 3 = decent read, 2 = disappointing, 1 = awful, just Interesting, but dated, but interesting because of that--he was certainly ahead of many in imagining ways computers/the internet could change things. Though as deftly handled, the subject of this book wasn't nearly as compelling to me as his earlier Understanding Comics, and I would probably have survived nicely if I'd never read this one--but would really regret not having read the first. I read "Understanding Comics" in grad school and loved it so I'm not sure how I didn't continue down the McCloud path. I stumbled across this somehow while doing research at work and had to read it. It's impressive how clearly McCloud envisioned the future of comics and he does a great job making the case for the format and all that it's capable of. This was published in 2000 so a lot of the information is dated, but at the same time it's valuable information presented clearly. If you want to gai I read "Understanding Comics" in grad school and loved it so I'm not sure how I didn't continue down the McCloud path. I stumbled across this somehow while doing research at work and had to read it. It's impressive how clearly McCloud envisioned the future of comics and he does a great job making the case for the format and all that it's capable of. As others have noted, "Reinventing Comics" is more a product of its time (and thus less timeless) than McCloud's "Understanding Comics." While there were many points where I was impressed by McCloud's forethought, there are so many interesting aspects of modern comics and e-commerce (Patreon, composition-as-product via Twitch's Creative streams, the advent of comic book movies and the notion of the "cinematic universe") that I was left wanting an updated edition more than anything else. “The Great American Graphic Novel hasn’t been written yet. If you want to dive deep into the meta of comics, this is the series to get you started. 📖 #2 is no slouch, even though it was written in the year 2000, it astutely sees the writing on the (digital) wall. Boa abordagem quanto como os quadrinhos podem melhorar, porém a história se perde quando conta sobre a internet, o autor poderia ter ido direto ao ponto em vez de contar do passado. Definitivamente o livro está desatualizado no contexto digital. Scott McCloud's "Comics Trilogy" is the official textbooks of Graphic Literature 101.